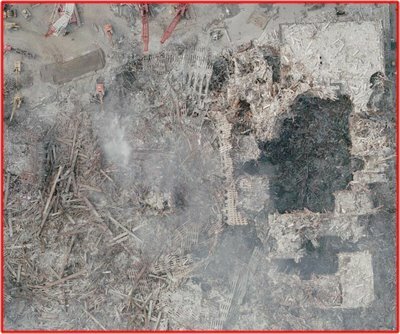 Humint Events Online: Ground Zero Smoking Gun #3: What the Hell Happened to the North Wall of WTC1? 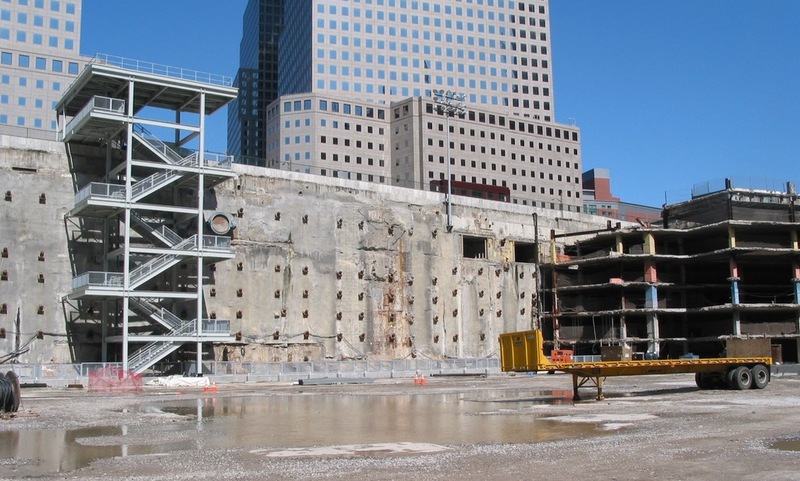 Ground Zero Smoking Gun #3: What the Hell Happened to the North Wall of WTC1? And the bottom of WTC6 didn't cave in because the parking garage under WTC6 was still intact! of 14 inch thick steel box columns. 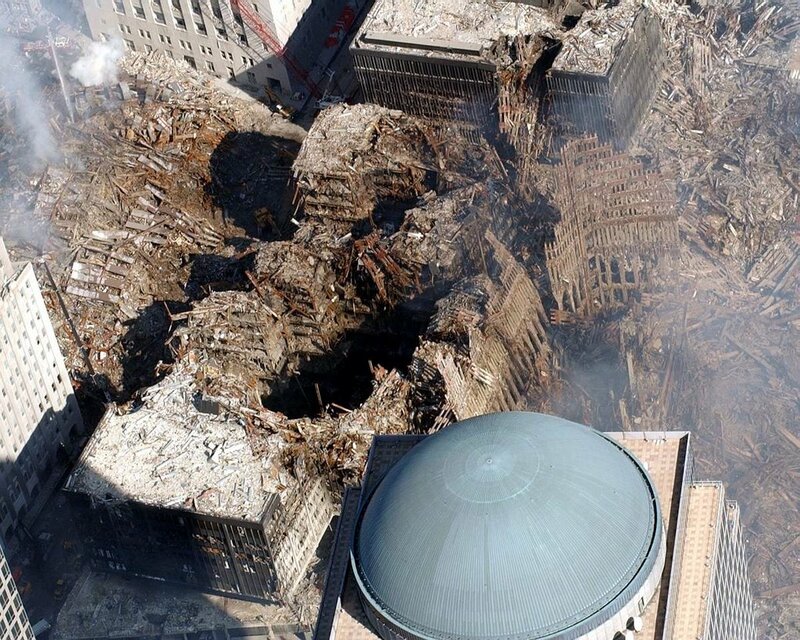 The only place it realistically could have gone is into WTC6. But think about it-- if you chopped up this wall of steel into nice 100 foot by 50 foot sections, and then stacked them up, you'd have a 63.5 foot pile. If you threw this wall down, so that it fell into a jumble, it would easily be twice as tall-- over 100 feet of debris. WHERE THE HELL DID ALL THAT STEEL GO???????? It is not in the WTC6 hole-- heck there is not even enough debris in there for the collapsed 8 stories of WTC6! The wall is not in the footprint of WTC1. It is, for all intents and purposes, the steel of the north wall is GONE. 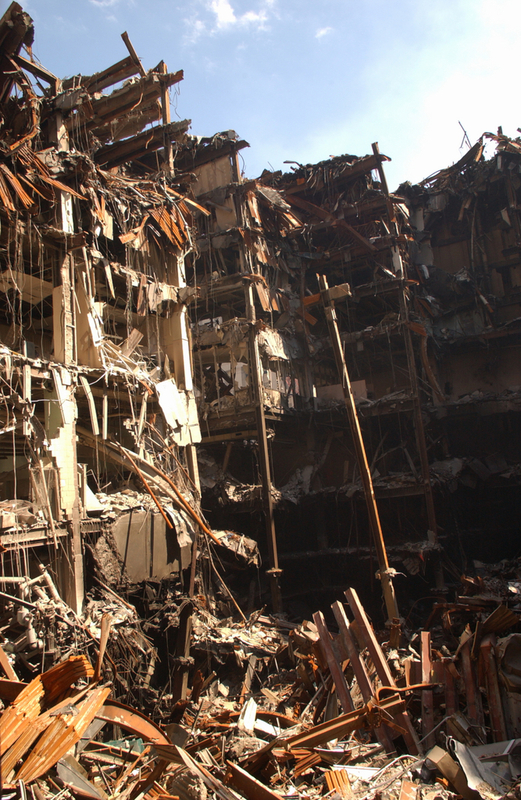 The only conceivable explanation is that, indeed, some high-energy weapon disintegrated the steel as it fell, at the same time making huge holes in WTC6. The other reason this makes sense is that the north wall of WTC1 was predicted to fall right ON THE EDGE OF THE BATHTUB surroundong the WTC complex. Thus, whoever planned the demolition was sure to take extra precuation not to have this massive mega-ton wall fall right on the edeg of the bath-tub. Keep in mind, when they "pulled down" WTC6, they were very careful to do it so it wouldn't damage the bathtub. This was a major concern. If the 8 story remnants of WTC6 were a worry to damage the bathtub when it fell down, how exactly was it that the mega-ton WTC1 north wall didn't destroy the bathtub when it came down? The only possible explanation is that the wall was disintegrated as WTC1 came down. the removal machine - one almost has to admire the efficiency that was exhibited in destroying and removing the entire wtc complex while leaving the bathtub foundation and the surrounding buildings for the most part intact. awesome. they should be pleased with the entire affair. STAYING THE COURSE OF COURSE! bushco inc: we're your go-to guys! Well, at first I thought "high energy weapons" was disinfo, but I'm starting to see how it had to be something more than conventional demolition and, please, that plane is so fake...so is thermite a distraction? 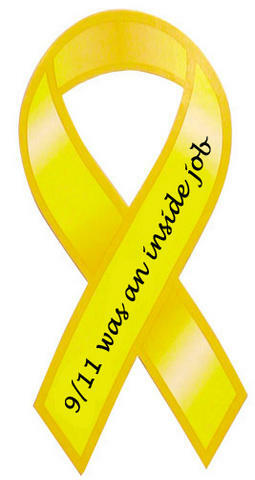 They've got us by the balls with all the disinfo infiltrator's, though, it's hard to know what is real and what isn't. Was there ever any steel evidence? or did it go to China, maybe that was a lie, too. I don't think the high-energy weapons stuff is disinfo at all. Look at the context of this action within the Bush/Cheney administration. You have Rumsfeld in there preaching "transformation" and wanting to use all the gee-whiz stuff that he loves. I'm something of a tech guy myself so I can relate to this. You also have the fact that when Rumsfeld was Secretary of Defence the last time around, Star Wars technology was ridiculed in the Press. Then you have guys in the planning of this "Special Operation" who are supposed to be coming up with a "Pearl Harbor" type of event. So, the goal is to kill an "acceptable number" of Americans to further the president's policy. From their point of view, 3000 people is not a lot. You've got a better chance of getting run over crossing the street or falling off a stepladder. You have a hundred times greater chance of getting killed by eating junk food and getting a heart attack. They probably believe that if we don't attack ourselves, some enemy will do it for us, and that they're making the world a safer place. All that BS. By striking the towers high up, they limited the casualties. By using the star wars technology, they minimized collateral damage to lower manhattan. The Port Authority had probably been begging for Federal money to clean up the WTC anyway, so this seemed like an "economically efficient" way to get rid of the buildings. What a wonderful policy! Everyone wins! Of course, the reality is that the whole thing is twisted to benefit specific people. It's no coincidence that Bush and Bin Laden have financial ties. Its obvious to anyone who wants to research it that the Bushes are in bed with the Saudis. It's obvious that Israel and the Neocons welcome an American policy to break up the Arab states and establish new goverments and American bases there. It wouldn't surprise me if they benefit from the increased heroin production in Afghanistan too. When you think in the way of the "true believers," 3000 American lives is a drop in the bucket. The planners probably think that they saved a million Americans by their wonderful psychological operation. Bush and Cheney don't care about American lives, they just see this as a good way to get the country behind their perverted agenda. I'm sure they love all the hero-worship they got after 9/11. Rumsfeld was even nominated Sexiest Man in America by some magazine. Those sick bastards love that kind of adulation. My guess is that the "Star Wars" stuff was probably tacked on by Rumsfeld, when someone pointed out that there was a risk that they could really screw up lower Manhattan and have a bigger Pearl Harbor than they wanted. I'm sure they tried out a bunch of other stuff we don't know much about, some of which worked well, and some of which didn't work so well. The CGI insertion seemed to have a few glitches, but it was good enough for government work. People believed what they saw on TV. I personally believed they used stealth cloaking and had a bunch of UAV's over manhattan, but I show my friends the videos and they say, well, that dot could be anything, and I say no, look, here it flew to the left, here it changes color and flies to the right... but you know. I guess I'm in the minority. Check out orbwar.com for nice pictures of stealth cloaking in action. Look at Boeing's "Bird of Prey" which they unveiled in 2002 I believe. It was a black program for over ten years. The CIA announced their use of UAV's after 9/11. So, you know, this wasn't just a star wars demonstration. It was an unveiling of unmanned aircraft as well (even if they didn't fly drones into the WTC.) I think they were also having lots of fun flying around various aircraft in disguise. They probably also wanted to test out their mass-media mind control propaganda capabilities. Bush senior is on the record telling Little Bush to "trust the CIA". That means embracing the full covert action capabilities of our intelligence community. Well, embrace it he did. What this shows, to me, is how important it is for the American Public to get educated so they don't keep putting sickos into high political office in this country. The covert action guys think they're serving their president and their country. We really need leadership with better morality who won't go power-mad and sacrifice their own countrymen for some misguided policy. When you get right down to it, Bush and Cheney conducted a giant human sacrifice right here in New York City. It's our job to get the country back on track so this never happens again. The Port Authority had probably been begging for Federal money to clean up the WTC anyway, so this seemed like an "economically efficient" way to get rid of the buildings. What a wonderful policy! Everyone wins! Actually I believe the real benefactor was Silverstein who got a free demolition, collected triple the insurance and got full rights to redevelop. However, I think there was a class action law suit underway prior to 9/11 because of the asbestos levels in the WTC. I didn't hear the clip, but a friend said she heard Bush make an indirect comment on air about how he would make the asbestos lawsuit disappear.